Imagine exploring a vast magical wilderness on the back of a flying dragon. Imagine forming a bond with this dragon and charging with it into battle, side-by-side as friends. If this sound like it’s down your alley then the upcoming Xbox One exclusive, Scalebound, might be the game you are waiting for. 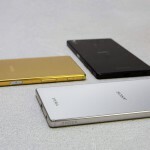 The release date for now is a vague “Winter 2016”. 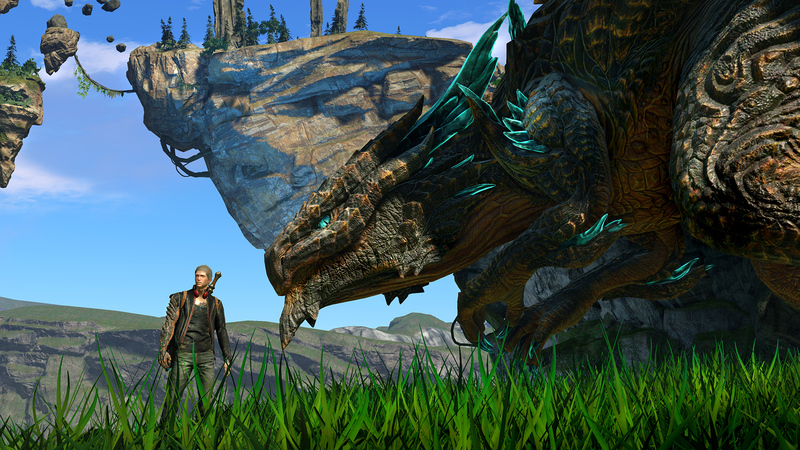 From what I’ve seen Scalebound seems like it is going to be a fantastic blend between the RPG and Hack ‘n Slash genres, with a slow-paced exploration experience seamlessly transitioning into an epic large scale battle. This also fits in nicely with the creator’s, PlatinumGames (Bayonetta, Metal Gear Rising: Revengeance) description of the game as an “open-world action RPG”. There is currently not much known about PlatinumGames’ impending title and most of what you’ll read and hear pretty much comes down to speculation. But it is hard not to get excited when you let your imagination run wild with the snippets of information that we’ve been allowed to witness. 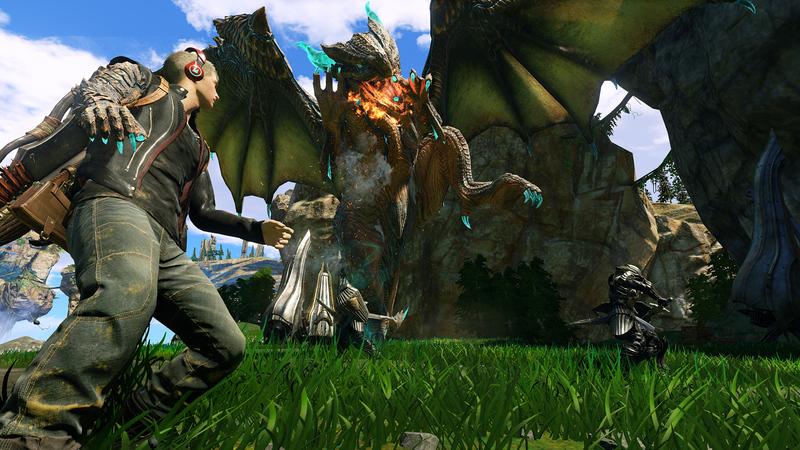 Scalebound will put you in the shoes of Drew, a young 20-something man from Earth. For some unknown reason Drew finds himself “pulled into” the fictional world of Draconis, an alternate dimension that is threatened by the presence of the Evil Empire. In most ways, Draconis is similar to an Earth-like wilderness. Its flourishing natural environment has an untamed beauty that has blossomed without the influence of human intervention and is filled with dangerous and majestic wildlife. Unlike Earth though, its creatures take on a rather alien and colossal appearance, and the world boasts strange but wondrous sites such as a of string floating islands. What makes Draconis particularly special is a giant mushroom (a kind of spin on the fabled World Tree) that emanates an energy known as “Pulse”. Pulse serves as the life force of all living things in Draconis and also gives the world its wonderfully unique appearance. It will also, eventually, provide Drew with a series of powers he can use in combat. When Drew enters Draconis he becomes bound to Thuban, a gigantic dragon and the last of his kind. This bond doesn’t seem to be by choice as, according to the reveal trailer, Thuban shows some reluctance towards working with Drew. Together they will face off against the Evil Empire (because obviously the Evil Empire is evil and they are doing something wrong). 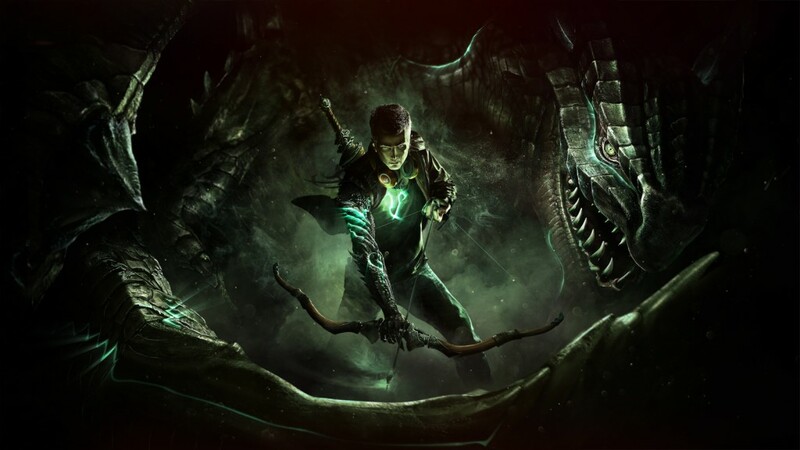 According to studio boss, Hideki Kamiya, the growing relationship between Drew and Thuban will be the main foundation of the story. When you have a large creature but you’re the player character, a human character, but there’s some sort of relationship forming – that is going to be the key to the story, how the relationship grows and the bond becomes stronger. That is really the theme of the background of the story. In the reveal trailer, Drew and Thuban seemed like they were still early in their relationship. Their chemistry had a believable and natural feel to it and it really made me wonder how it will grow as you progress through the game. The bond seems like it forces the two to work together. According to the research that I’ve done, if the one dies the other will die too. This makes me think that this bond will carry great weight in terms of the overall narrative. There’s not much more to go on, in terms of story, but what is known so far does make me very excited. It seems that Scalebound will explore some deep and intriguing themes which I think will make for an immersive and captivating gaming experience. 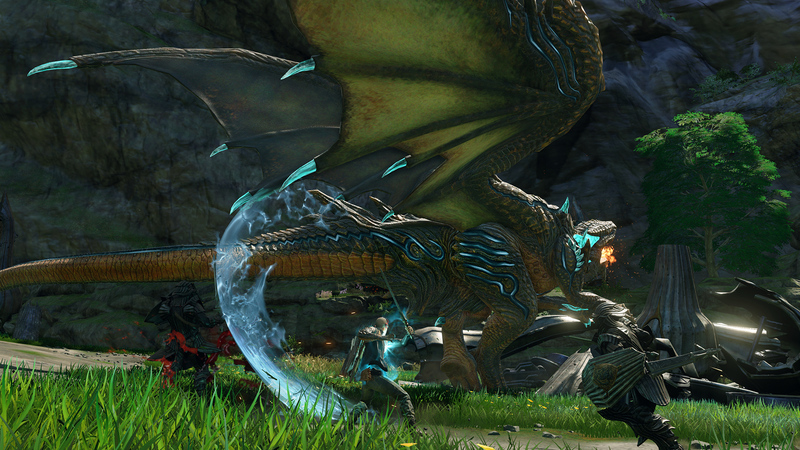 Compared to the story details, PlatinumGames has provided us with a fairly clearer picture of what Scalebound’s game play is going to be like. It’s still not a lot to go on, but the little I’ve seen and read already has me craving for more. The reveal trailer mainly showcased combat and focussed on the battle chemistry between Drew and Thuban, and I think that is what Scalebound will generally be centered. They start of first by dealing with a large group of medieval looking soldiers. Here Drew jumps into combat with an admirable flurry of hacks and slashes, shoots some explosive arrows and throws in a few Pulse energy special moves with his dragon arm. The weapon seems to have some magic ability to it and it looks like Drew has to build up momentum before he can use his Pulse moves. But it all seems to complement each other smoothly and makes me think that fighting in Scalebound is going to be a hell of a lot fun. Thuban is controlled by AI and starts off by using melee type moves such as foot stomps and charges to deal with large group of enemies. But as the fight start picking up, you see a healthy amount of fire flying around the battle ground. Drew is also able to direct Thuban in battle, commanding him to deal with one group of enemies or smash down a building while Drew keeps on dealing with his own business. But this fight is quickly followed by an encounter with one of Draconis’ wild-life, a monolithic mantis-crab creature that seems a bit on the hostile side. Here Drew has to step back a bit and let Thuban do his thing. The dragon charges in, blasting a spectacular fountain of flames in the opposing creature’s face, all while beating him senseless with his tail horned tail. But the mantis-crab- doesn’t go down that easily and Drew has to play his part too. Here you see the other side of Drew and Thuban’s battle dynamics at play. While Thuban fights the enemy creature, Drew uses his dragon arm’s Pulse abilities to heal Thuban and find weak spots on the enemy. Once he has located the weak spot he can use Pulse enery to create a grappling hook and slingshots himself towards the weak spot and exploits it with quick succession of stabs, crippling the creature and creating an opening for Thuban to deal some serious damage. “The core concept of this game is we want to show off this large, epic-scale battle taking place with these large monsters. That’s where it really begins. It’s unlike any action oriented game that we’ve made.” said Kimiya. Our games in the past were really intense, high-impact, high-pace sort of action games that required skills. 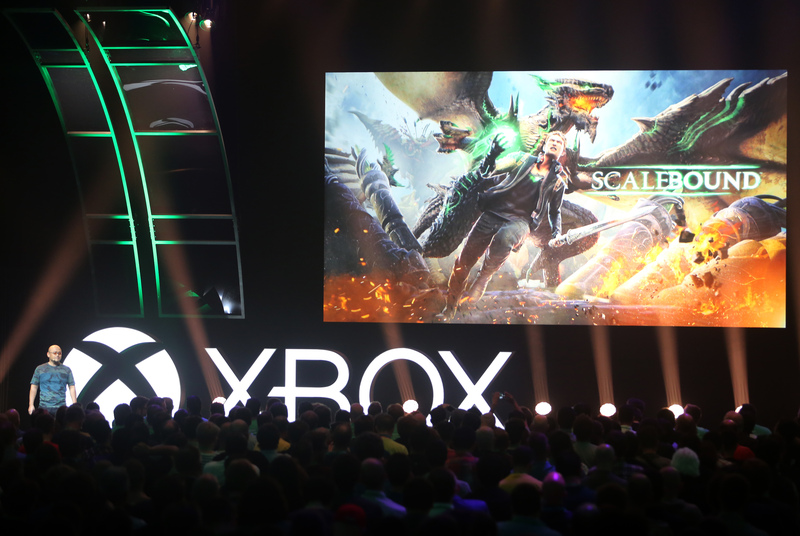 In that sense, Scalebound may not deliver the difficult experience that you’ve seen from our games. At the same time, that doesn’t mean that it will be easy. There will be various ways to plan your strategy and to figure out how to overcome the battles and encounters. It’s more of an all-around, really bringing out the fun in the various levels. Considering everything, there are still two big unanswered questions: How “open” will the open-world be, and how deep will the RPG system go? The reveal trailer lacked to answer these questions in any conclusive way yet, I think, this is what most people are wondering about. If we look at the trend of open-world and exploration games in recent years, I would say that PlatinumGames definitely would have put in the effort to create a large scale gaming world. But to create something that does its premise justice is going to have to be quite a feat. If we are talking about flying around a massive dragon then the game world has to be rather gigantic to make a player really revel in this wonder. But this will also lose its appeal quickly if there is nothing that motivates exploration. And I think this is where a strong RPG system will have to come in. If it would be my guess, I would say Scalebound will be somewhere between the vast landscapes of The Witcher and the illusionary openness of something like Darksiders. Scalebound looks like it will incorporate some pretty old school mechanics such as collecting gems dropped by dead enemies. These gems will be used for things such as upgrading and customising Thuban. There will also be no weapon crafting system available and the weapons you will be using will be found scattered across the world, with some probably requiring you to complete a quests to unlock it. My guess is your gems will also go into upgrading you various weapons. 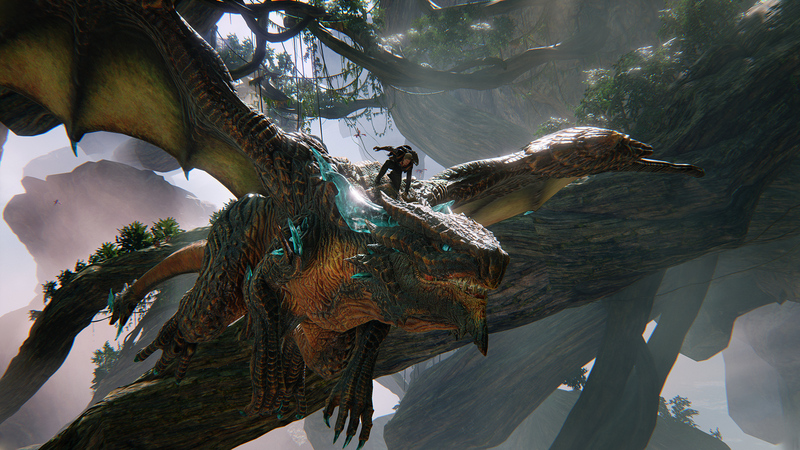 At this point it is really hard to say how Scalebound is going to turn out. It will definitely be a visually stunning game packed with action and it looks like it will explore some deep and emotional themes that will lead to a well-rounded game. The fact that you are the companion of a fire-breathing dragon also gives it a unique edge that I think many of us crave. The only problem with the tiny snippets of information we have at our disposal is that our imagination is filling in the gaps. I sincerely hope that Scalebound will at least in some way live up to my ambitious expectations. If it does, Platinum Games will have created an astounding title that will be remembered for quite some time. But only time will truly tell.